Surviving specimens vary in dimensions, but are often made from silk or oiled paper and are 10 – 20cm x 10 – 20mm. Packs are suits 1-9 with one “general”, and may have 25, 40, 50, 60 or 80 cards. Depending on influence from local customs and ordinances, as they are in Europe, Japan, etc. Language has elements of card games, as happens in other cultures as well. They are generally believed to be based on Madiao/Majopae cards from China. One story dates them to the reign of King Sukjong (1674 -1720), another to their portrayal in a performance of a Chinese play (1628-1644). Ethnographer Stewart Culin suggested in his 1895 book Korean Games, with notes on the corresponding games of China and Japan that Tujeon may be based on ancient divination arrows, but modern scholars do not strongly support this. 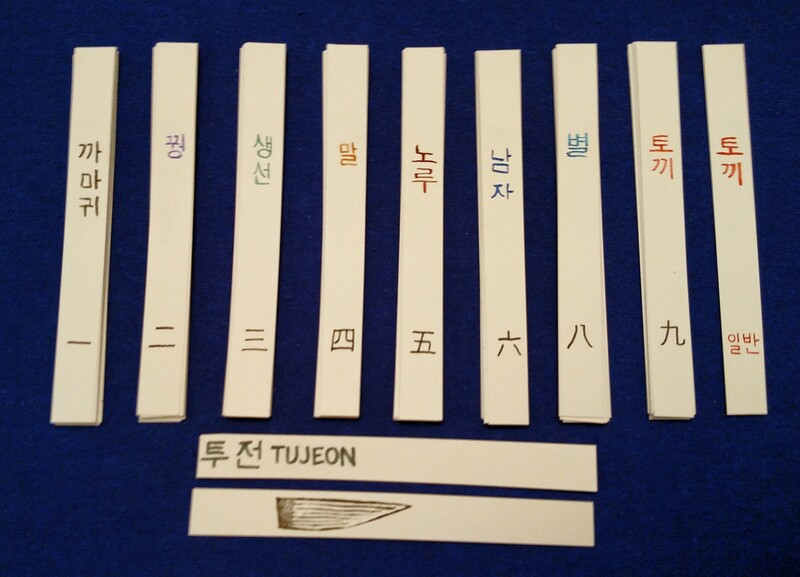 Tujeon play was widespread during the Joseon Dynasty, and overtook Baduk (Go) and Janggi (Chess) in popularity. Hwatu (Hanafuda) cards introduced in the 19th century proved to be popular enough to cause the decline and ultimate demise of Tujeon games. 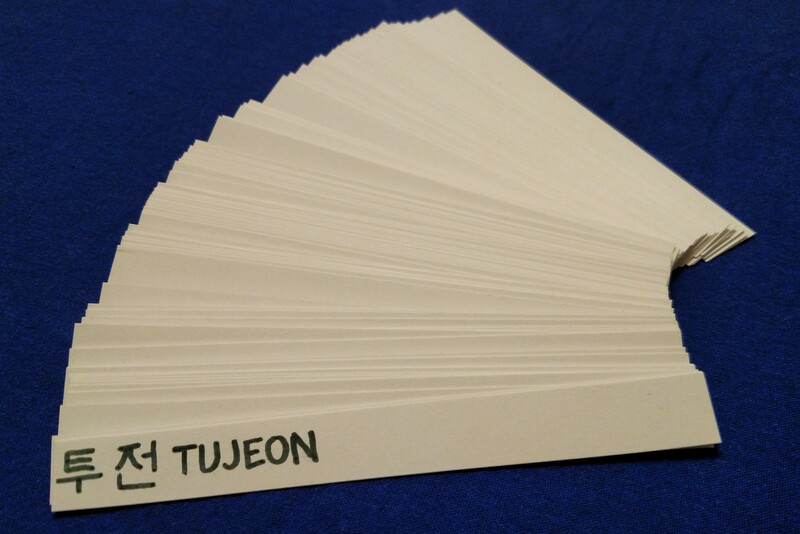 Tujeon card games include Baccarat, Blackjack, and Ombre style games. Influences can be a mix of influences from China and Japan. For dimensions I referenced the few packs encountered; they will be 15 x 150 mm. 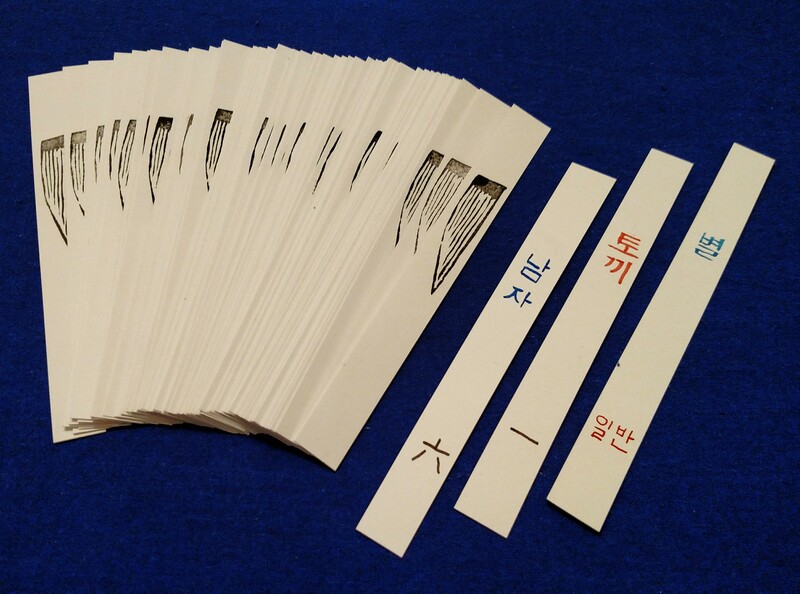 Existing specimens also feature strong calligraphic elements, and even native readers suggest players memorize the cards before play. At some point compulsion will likely drag me into understanding historic Korean calligraphy better, as the reputed ease of the (modern) writing system makes it inviting. Meanwhile, I wish to emphasize the different suits without too much distortion from historic examples. For this prototype, I’m going with Hangul for the suit signs and Hanja (Chinese) for numerals, except the “general” cards, also in Hangul. * Paper cutter set up to desired dimensions, proceeded to cut up several sheets of smooth bristol paper for a pile of card blanks. * Ink number signs, let dry overnight. Since they rub in play, I want to be sure. * Gently seal with clear coat.